After the recent post written just a day after the announcement of water on the Moon and why this is a game changer I decided it would be a good idea to write another more structured post laying out in simple terms why we now need to focus entirely on the Moon and forget about Mars for the time being. Here are ten simply reasons why it's time to turn our attention entirely to settling on the Moon and put Mars on the back burner for now. In spite of the recent discovery of water all over the surface of the Moon one can find comments to the effect of "eh, it's still drier than the Sahara so what's the big deal?". Well, the big deal is that even this soil that is drier than the Sahara now means that we will be able to extract water from the soil that we had assumed we would have to take from Earth before. There is likely water in the shadowed craters in the polar regions, but being able to extract water from the top 2 mm of soil is a process that can be carried out anywhere. Also, it costs $10,000 to send a kg of payload to low Earth orbit, and to the Moon (if I remember correctly) it would cost around $200,000 per kg. In other words, just 5 litres of water created on the Moon saves us $1 million that would otherwise have to be spent sending the water from Earth. The Apollo Lunar Module had 2,353 kg of propellant for the ascent stage, all of which was made and shipped from Earth. Being able to make this fuel on the surface of the Moon instead (simply by turning the water gathered into hydrogen and oxygen) would have resulted in $470 million that wouldn't have to be spent. 1) We have a great deal of experience with microgravity (0g), but no experience whatsoever as of yet with low gravity (0.16g and others). So far the record number of days spent in orbit around Earth is 437 days, so we know that even with no gravity whatsoever we can send people up into space for periods of time greater than a year. Also note that muscle atrophy is reduced by regular exercise, but exercise still needs to be a conscious effort. Low gravity, on the other hand, works on the body 24 hours a day. 2) One-way travel to Mars takes around six months. Add another six months back and any astronaut going to Mars is going to have to experience at least a year of zero g in addition to the lower gravity on the planet itself. Even if low gravity turns out to be a fatal flaw, those on the Moon can return to the Earth within three days to return to normal gravity again. One of the strongest arguments for going to the Moon instead of Mars is the fact that even before the discovery of water we have had a great deal of international cooperation, with probes from Japan, India, and China in addition to the US. Eight more lunar missions are slated to happen within the next four years, compared with only three to five for Mars. When a mission to the Moon is delayed the delay is only the length of the time it takes to compensate for the delay, whereas with Mars a delay means a wait of 2.5 years until the next launch window. This has caused the Mars Science Laboratory and Phobos-Grunt missions to be delayed to 2011 from the original 2009 planned launch. In short, emerging spacefaring nations can aid in understanding and exploring the Moon. With Mars most cannot. In addition to the short 3-day travel time to the Moon, it is also close enough that near real-time communication between those on Earth and the Moon can take place. If you've ever watched communication between astronauts in space and mission control on the ground you know how important this can be, as astronauts converse continually with mission control in order to carry out their mission objectives as precisely as possible. Astronauts on Mars would more or less be on their own in this type of situation, and would have to wait at least 10 minutes after sending a message for it to be returned. This distance also means that robotic probes move about quite slowly on Mars, as those on the surface send it a message, wait for it to carry it out, discuss the next move, send the next message, and end up only being able to carry out a few maneuvers each day. A rover on the Moon can accomplish much more due to those on Earth being able to see the results of their commands within seconds instead of minutes. The Moon has days and nights of 14 days in length each, but luckily it also has a few peaks of near eternal light where electricity can be gathered up to 89% of the time. 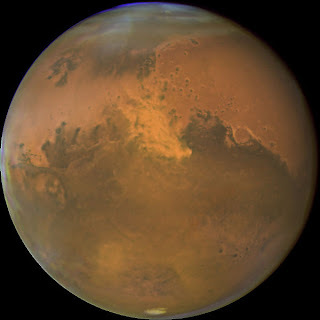 Mars has weaker sunlight, no peaks of near eternal light, seasonal variation (less sunlight during the Winter), and sometimes dust storms that block a lot of the light from the sky. The rovers currently on the surface of Mars have been forced to stay still to conserve energy during these dust storms, and the image on the right shows just how large they can be, sometimes covering an entire hemisphere. The Moon is the only location where private industry may be able to cooperate alongside with government-run space programs. 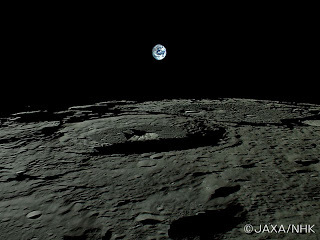 A private company could in theory set up shop on the Moon right now, gather a few thousand tons of water, collect it on the surface and then sell this water to NASA. Virgin Galactic eventually intends to send people not just on suborbital flights but also to LEO and later on to trips that go around the Moon and back. And even Google is involved in going to the Moon, with a $30 million prize known as the Google Lunar X Prize. As is the case with new spacefaring nations, private industry is also just reaching the point where it can aid us in colonizing the Moon, but Mars is beyond their ability. The Moon can be seen in the sky just about every day, and when a colony is built there anyone on Earth will be able to look up and reflect on the fact that we don't just live on Earth but up there as well. Eventually colonies may be able to be seen with telescopes and binoculars as well. Those on the Moon as well will always have the comfort of the Earth in the sky, and let's not forget that we still know nothing about the psychological impact of being away from one's planet for any length of time. Mars, on the other hand, is a dot in the sky that cannot always be seen and most cannot even identify. Those on the surface of Mars would also see the Earth as just a dot in the sky. One point not often brought up is that landing sufficiently large payloads on the surface of Mars is actually beyond our capability. The problem with Mars is that there is too little atmosphere to land like we do on Earth where the atmosphere slows one's fall until a parachute can be used, but too much to enable us to land using rockets alone. 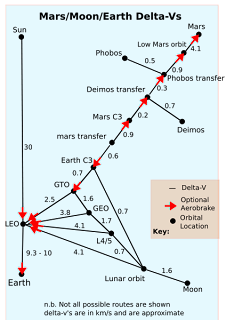 Delta-v from Earth to low Earth orbit is 9.3-10 km/s, from Mars to low Mars orbit is 4.1 km/s, and from the Moon to low Moon orbit is a mere 1.6 km/s. Add to that the lack of an atmosphere and the Moon is an ideal location from which to build and send probes to other parts of the Solar System. 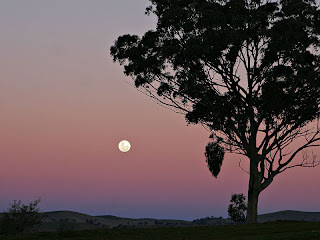 Given the lack of an atmosphere the Moon is an ideal location for certain types of astronomy. 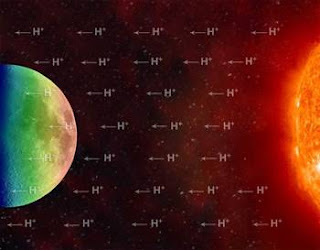 A liquid telescope could even be built on the Moon (gravity + no wind makes this possible) in addition to more conventional telescopes and telescopes on the far side of the Moon that would benefit not only from the lack of an atmosphere but also the shielding provided from Earth's noisy radio signals. The 14 day night also gives an opportunity to observe over a very long term, something that just isn't possible on planets like Earth and Mars. Even the Hubble Space Telescope doesn't have this advantage as it is continuously moving from day to night in its orbit around the Earth. Also, for those that missed it here is the press conference giving the details of the water discovered on the Moon.